There are two groups of salivary glands, major and minor, in our body. Major salivary glands are parotid gland, submandibular gland, sublingual gland. Apart from these, there are a large number of minor salivary glands spread all over the mouth and throat. The salivary gland’s main task is to produce saliva. The saliva produced is moisturizing the mouth and throat, is effective in defending against microbes and helps digestion. The saliva produces about 1.5 liters of saliva per day. Salivary glands may be infected by viruses and bacteria. Viruses are the most common cause of mumps virus and are seen mostly in children, especially parotid glands. The swollen salivary gland rapidly develops painful swelling and redness. Pain medications and antiinflammatory drugs are used to treat viral salivary gland inflammation. Antibiotics are also used in addition to bacterial inflammation. The patient is offered plenty of water. Surgical removal of the salivary gland may be necessary for chronic (inflammatory) infections, which often recur and cause permanent damage to the salivary glands. Sialolithiasis may develop due to reduced saliva flow and condensation, salivary duct damage, or calcium salts. The stones can be found in the gland or in the channel where the gland is secreted and cause clogging of the saliva flow. The glandular stones usually appear in the lower jaw (80-90%) salivary gland, less frequently in the ears (10-15%) and very rarely in the dorsal and minor glands . Ultrasonography is a suitable method for detecting salivary gland stones. Sometimes evaluation with computerized tomography may be necessary. Untreated, stones can sometimes fall off spontaneously through the channel of the salivary gland. Sometimes it is necessary to surgically remove minor interventions made on the canal. In recent years, endoscopically, salivary gland stones can be intervened. However, the salivary gland needs to be surgically removed in the treatment of large, deeply placed stones that can not be removed. Most salivary gland tumors are found in the parotid gland and others in the submandibular, sublingual and minor salivary glands, respectively. In the diagnosis of salivary gland tumors, various benign or malignant imaging modalities (such as ultrasound, computed tomography, magnetic resonance imaging) are used. In addition, a needle biopsy must be performed on the saliva gland. According to imaging methods and biopsy report, it is determined how treatment will be applied to the patient. 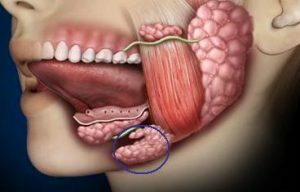 Benign tumors usually manifest themselves in the form of painless swelling that gradually grows over the years in the salivary gland. Surgery is the treatment of salivary gland tumors found to be benign. Benign tumors do not require additional treatment after surgery. In malignant tumors, rapid growth, pain, color change and facial paralysis may occur. The primary treatment for malignant tumors is the surgeon. In addition to surgery, radiotherapy and chemotherapy may be needed for malignant tumors. The most important risk in the surgical treatment of Preauricular tumors is the risk of developing facial paralysis as the facial nerve passes through the salivary gland. The most important risk in submandibular salivary gland surgery is the partial facial paralysis at the lip corner due to the deterioration of the function of the branch to the lip of the facial nerve. The risk of surgery will increase as the mass grows in salivary gland tumors. In benign tumors, it is suggested that surgery should be done without enlargement when the tumor is small.